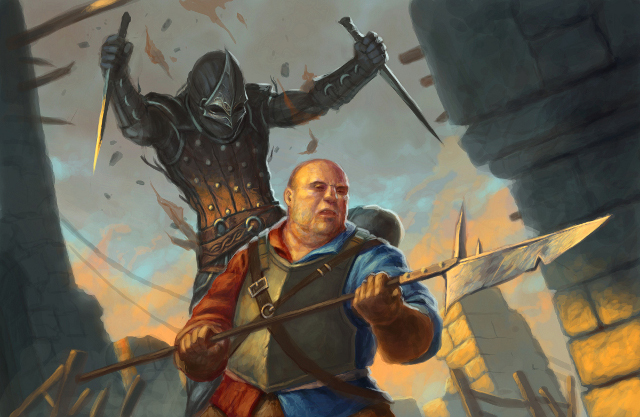 Just thought I'd share with you a piece of concept art from the new version of Celtic Heroes, which shows a Rogue surprising a poor unsuspecting guard. Hope you like what you see; we'll hopefully have more to share with you soon! honestly if you manage to balance all the classes properly and make as cool designs for other classes, the engine would be perfect. Very nice. It's seems simpler but it has new detail and gives the rogue an interesting aspect. The new engine will change everything though, ya? Not just appearance? Is it from dave ? I saw his deviantart and this guy s epic !! OTM I can also draw pictures..
[KnightOfFear] wrote: OTM I can also draw pictures.. However, yours will not be featured in the new engine. Eh, I was fairly certain I saw admin explain it was a "complete rewrite of the game." I guess I should go hunt down those old posts. Got the hint there, OTM? Can't wait to see more of what you guys have in store!